Bedford stay in 17th position in the Evo-Stik Division 1 Central after dropping two points in a 2-2 draw at Daventry Town. Craig Adams included new signing from Kettering, Joe Curtis, in the line-up. One sad moment was the last appearance – this season at least – in a Bedford shirt for Jeff Woodward who is Australia bound. Woodward gave his boss, team mates, and the travelling support a great parting gift in only the second minute of the game. Ross Oulton’s corner kick from the right went to the far post, and the central defender – who has started in 37 of the 39 matches Bedford have played this season – bravely dipped his head to direct the ball into the net. The Eagles kept on top of their opponents and Ollie Wilkinson’s long ball out of defence found Paul Cooper. The defender crossed into the area where Louis Porcelli punched the ball away from the head of Will Summerfield, but only to Joe Curtis on the edge of the box. With the Daventry defence in disarray, Curtis hit a first time shot that Porcelli dived to his right to save. Porcelli denied Curtis again midway through the half. Cooper’s well weighted ball found the attacker on the right hand corner of the area, and although the control was good and the shot was goal bound, Porcelli brought off another good save to deny Curtis. With all the attacking coming from the visitors, Daventry had a rare chance at goal when a corner, defended out of the area, went to former Eagle, Simon King. King produced a shot through a crowd of players, but Garry Malone was well positioned to save comfortably. With so much possession, Bedford needed a second goal, and on the half hour it came. Curtis dispossessed a defender before looking up and finding Cooper on the right. With no defender in sight, Cooper raced into the area before calmly slotting the ball past Porcelli. For all their dominance in the first 45 minutes, it was a surprise Bedford were only 2-0 up at the break. The Eagles kept up the pressure after the restart and Porcelli punched a cross out to Woodward, who returned the ball from the edge of the area, but just cleared the bar. Rob Parker then brought a stunning fingertip save from Porcelli from his goal bound header. From the resulting corner, Josh McGoldrick’s cheeky back heel just went the wrong side of the post. Daventry slowly gained more possession, but couldn’t make a vital assault on the Bedford goal. Just after the hour, McGoldrick’s cross from the right byline wasn’t defended properly and Parker responded to the half clearance with a measured, low shot that rebounded off the base of the left hand post. Summerfield raced in, but Ryan Zidyana cleared. The hosts pulled a goal back on 73 minutes, when Ashley Deeney scored direct from a corner. Spotting no Bedford player on the near post, Deeney curled the kick in. With Bedford living dangerously, Daventry were denied by the woodwork from another corner when Joe Henderson’s headed came off the underside of the bar, and bounced on the line before a Bedford player cleared. Bedford looked for a third goal to try and put the game beyond Daventry, but with seven minutes remaining, a break from defence gave the home side the equaliser. 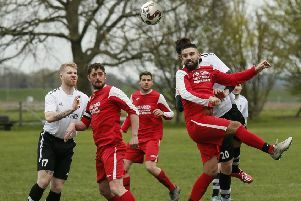 A long and hopeful clearance wasn’t dealt with properly by two Bedford players and Anthony O’Connor took advantage to race between them and slot past Malone after he entered the Bedford area. With five minutes to go, the woodwork denied Bedford again, as Curtis Shaw’s shot in the area cannoned off the bar. In the ensuing scramble, Parker saw his shot blocked and cleared. Bedford’s last chance fell to Greg Ling, but his header, from Shaw’s cross, was directed wide. For Jeff Woodward, it’s a pity that the Eagles didn’t get the victory, but in such a young side (nine of the eleven were 21 or under), the learning curve will be priceless. Eagles: Garry Malone, Paul Cooper, Jon Bukasa, Rob Parker, Jeff Woodward, Ollie Wilkinson [c], Josh McGoldrick, Ross Oulton, Joe Curtis (Curtis Shaw 70), Will Summerfield, Luke Fairlamb (Greg Ling 76). Subs not used: Kerran Birch, Jordan Davis. Daventry: Louis Porcelli, Ashley Deeney [c], Ricky Hill (James Hancocks 65), Joe Henderson, Ryan Zidyana, Arron Parkinson, Miles Welch-Hayes (Ryan DaSilva 47), Anthony O’Connor, James Tricks, Harlan Basker (Pierce Kiembi ht), Simon King. Subs not used: Andrew Musungu, James Weale. Assistants: Costandinos Christodoulou & Ioannis Christodoulou.